Dave on the way to Italy in 1990 wearing the coat that was part of the ‘denim jacket incident’. 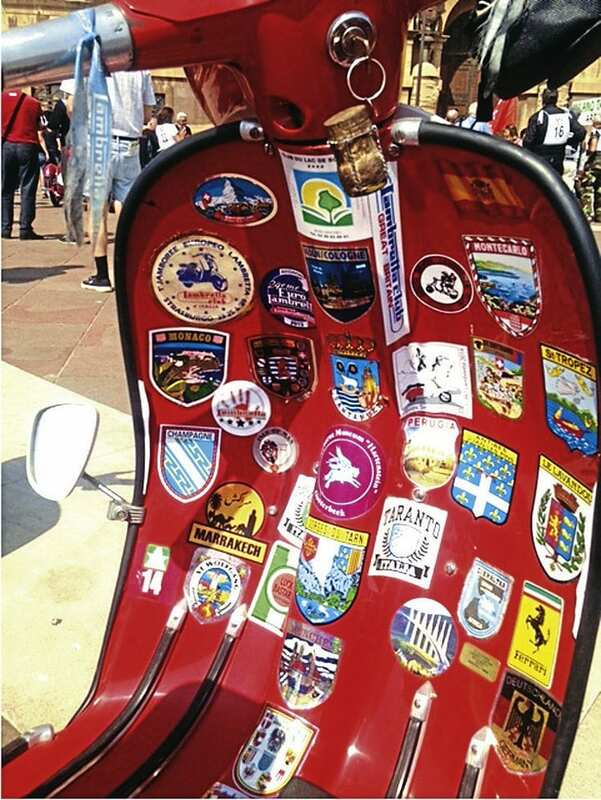 For more than four decades Dave Waddingham has pounded the roads of Britain and Europe on his Lambretta. And for several years he has found new motivation by taking on ever tougher challenges, none more so than the annual Milan-Taranto race in Italy. The famous and prestigious race is run every summer over several gruelling days covering a distance of 1500km. Dave has been doing the event for several years as he seeks to push himself and his trusty Lambretta even further. Getting ready for the off in Switzerland. Allegedly this was the first time the side panel had been off since the Lambretta left the factory some 20 years earlier. Dave’s Lambretta journey started way back in 1973 when at the tender age of 15 he acquired an old rusting Lambretta. His exploits back then were a far cry from today, just riding up and down a disused railway track at the back of his parents’ house at Creswell, in the East Midlands. It was nothing too exciting, just a venture to the next village and back but apparently never on the road. Once he was old enough, Dave got his Lambretta on the road and has never looked back since. Joining the LCGB at 18, he is one of the longest serving members of the club, defiantly one of the LCGB old school. 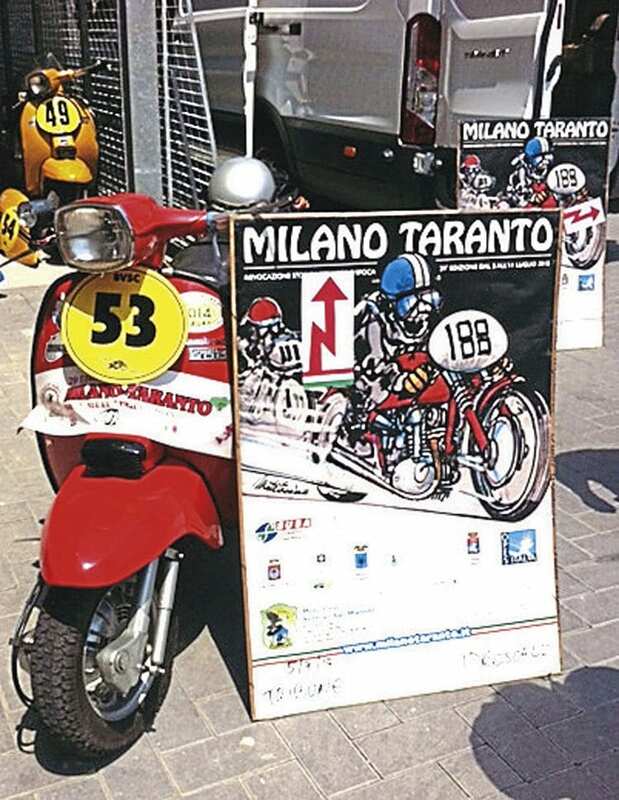 Proudly displaying his entrant number and banner for the 2017 Milan-Taranto. Like every other scooter rider over the years Dave attended rallies far and wide the length and breadth of the country. The problem is it’s easy to get complacent and bored with just doing the same rallies and trips year in, year out. Dave’s first big journey and something completely different was the now legendary John O’Groats to Land’s End run done by members of the LCGB in 1988. 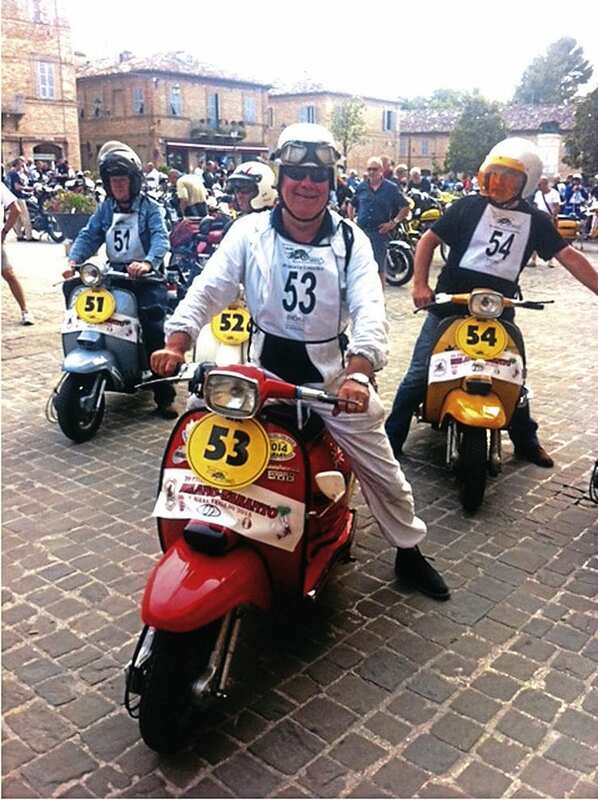 The following year saw the first Euro Lambretta held in Strasbourg, France, which Dave duly attended. Members of the Barnsley Vikings Scooter Club posing for a photo shoot before they set off. 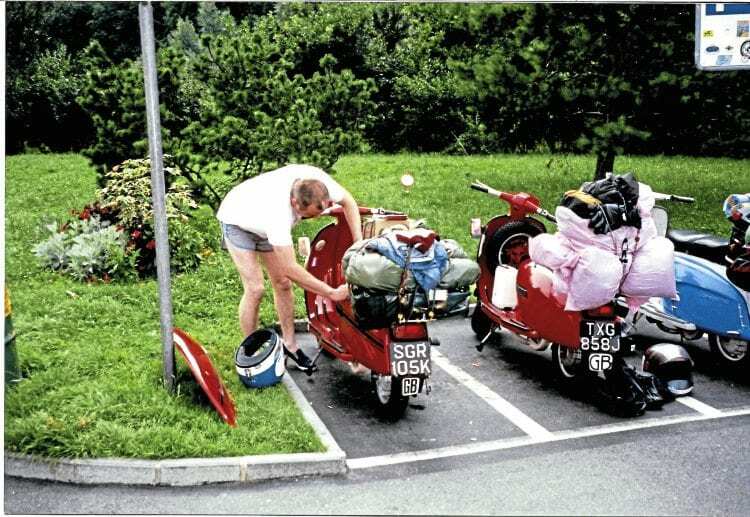 Travelling in to Europe had whetted Dave’s appetite for venturing much further on his Lambretta. In 1990 he completed a grand tour with a small LCGB contingent through Belgium, France, Germany, Switzerland and Italy. Visiting the Innocenti factory and returning his trusty Lambretta GP back to its original home. Every year he would, like many others, make the mass exodus to the Euro Lambretta often taking long and bizarre routes just to get there. If you joined in one of Dave’s grand tours you were assured that it would be tiring from the distance and exhausting from the tanker loads of alcohol that would be consumed. Paying homage to Italy’s greatest motorcycle rider. As Dave once put it: “I need a two week holiday to get over the two weeks if just had off.” The majority of the tours and journeys were done on his trusty steed, a 1971 Lambretta Grand Prix 200. 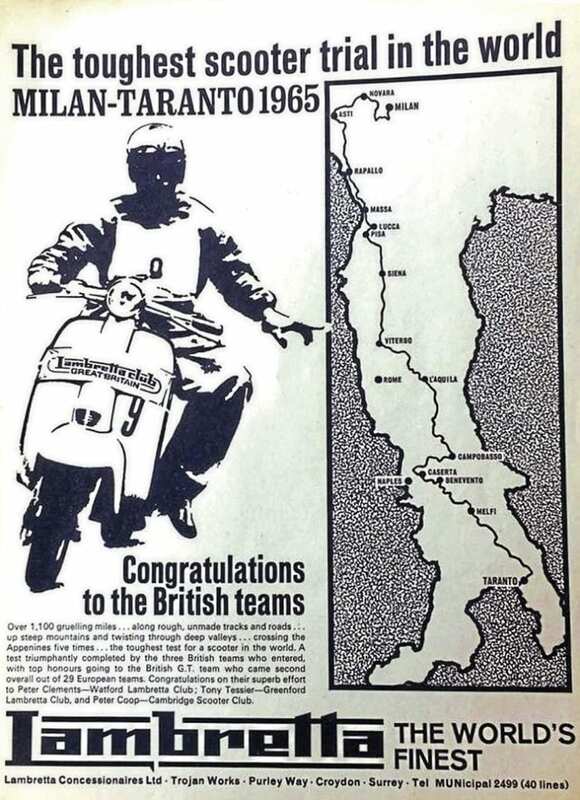 The advert by Lambretta Concessionaires congratulating the 1965 team, showing just how far the race actually is. Though Dave owns many other Lambrettas including a Model B, Model C, several LDs, Vegas and an SX 200 it’s the GP that is the workhorse. Cruising speed is fair with its mild tune but more important is the reliability and economical running. Dave’s philosophy is there is no point doing long distance touring and riding if it’s going to cost you a fortune in fuel and constant breakdowns from an over the top tuned engine. That’s probably why he has clocked up tens of thousands of trouble free miles over the years, making the journeys far more enjoyable. Dave always happy to assist in advertising this great event. After years of constant touring, Dave needed new challenges to motivate him when it came to riding a Lambretta. 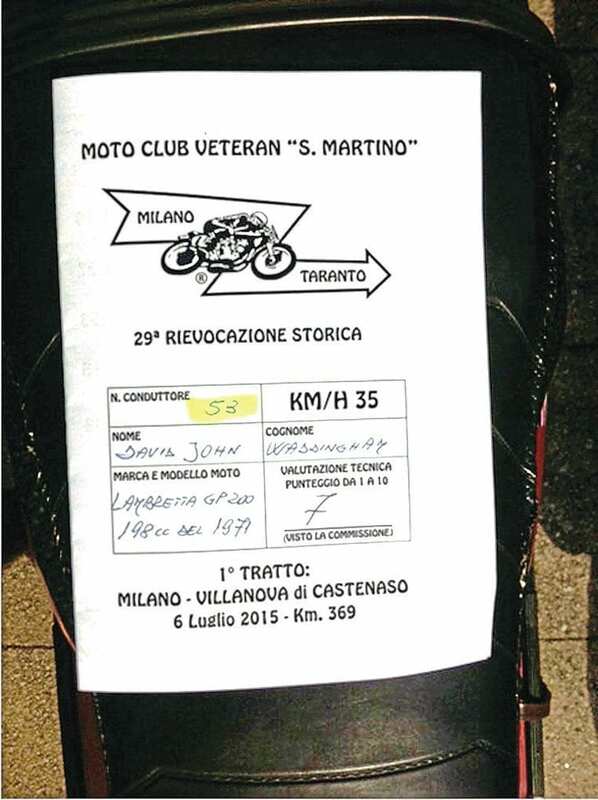 The answer for him lay in the prestigious Milan-Taranto endurance race. 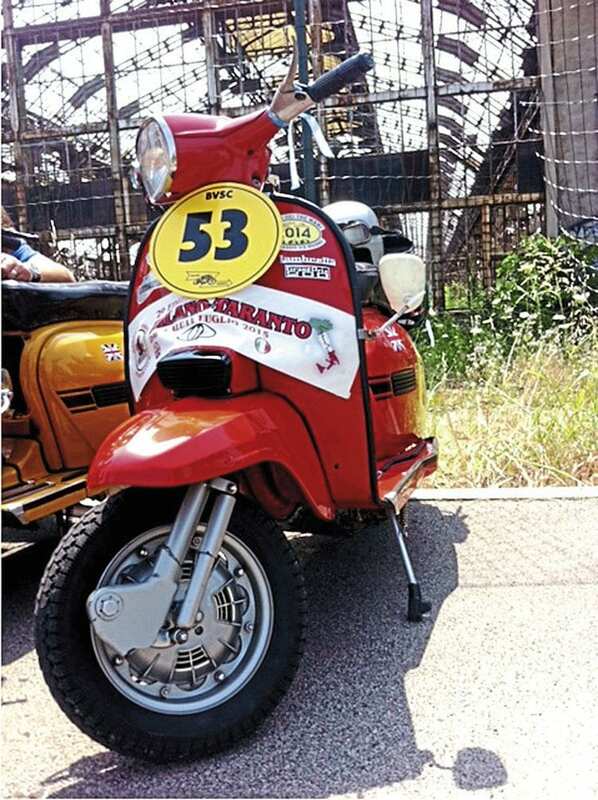 It has a deep history going back decades with many of the great Italian motorcycle manufacturers entering including Innocenti with the Lambretta. With competition stronger than ever, the race still lures riders to this day from far and wide across all corners of the globe. 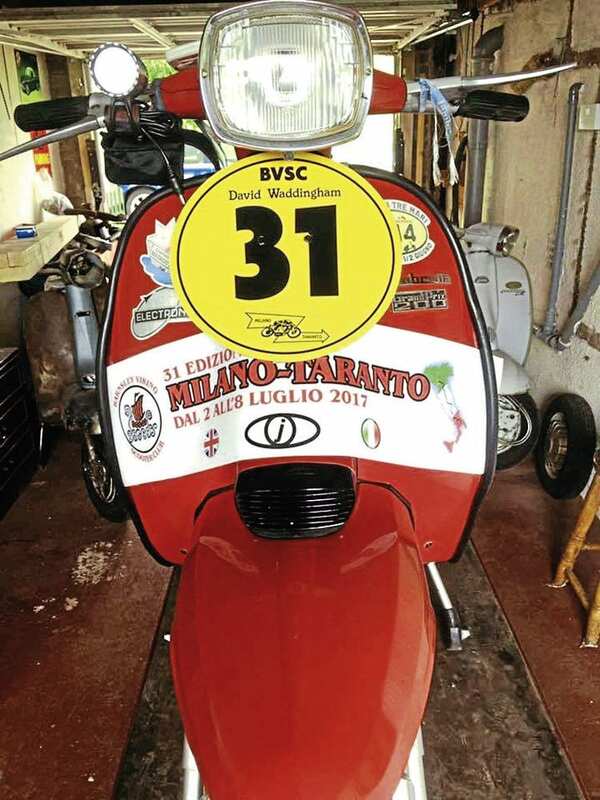 In 2015 Dave along with several other members of the Barnsley Vikings Scooter Club entered the race for the first time. 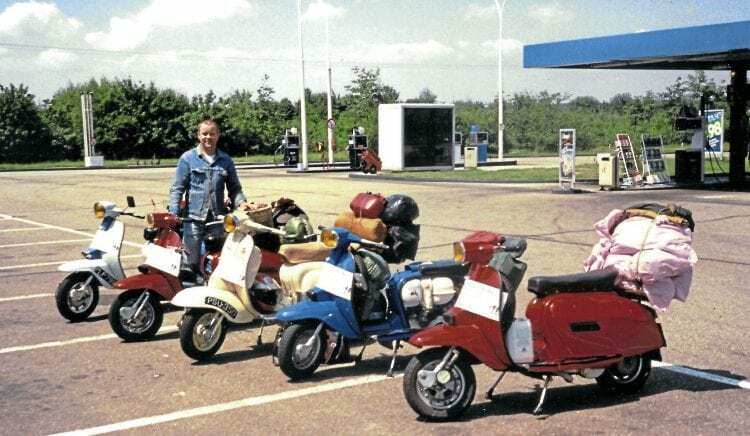 Though he had been talking about doing it for years, getting round to actually sorting everything out and organising a team of like-minded Lambretta riders took quite a while. The Barnsley Vikings didn’t need too much persuading though; again many of them are long time endurance Lambretta riders. The whitest man to ever ride a Lambretta. Each year the route is slightly changed but is always around a total of 1500km in distance. The ‘Mi Ta’ as it is more commonly known starts every year at midnight from the Idroscalo region of Milan. 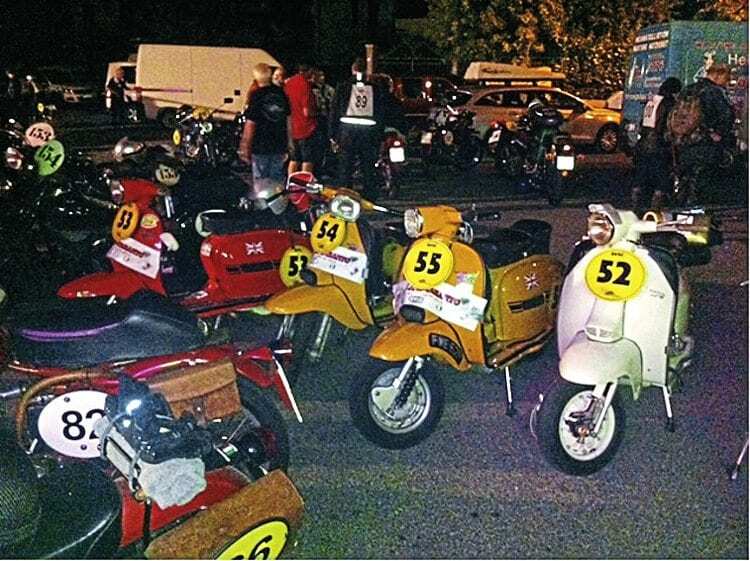 This consists of small groups of three or four machines leaving at two minute intervals with the scooter section usually leaving around 12.30am. This then finishes in Taranto at the foot of Italy in the three seas area some six days later. Each day there is a specific timed check-in point at the finish of each stage. Quite often there are huge crowds lining the streets to applaud the riders as they cross the line. Most evenings are spent drinking wine and eating the great spread of food that is always laid out for competitors. This also gives the riders time to do any maintenance required and talk about the day’s events with one another. Midnight start for the blurry eyed competitors. 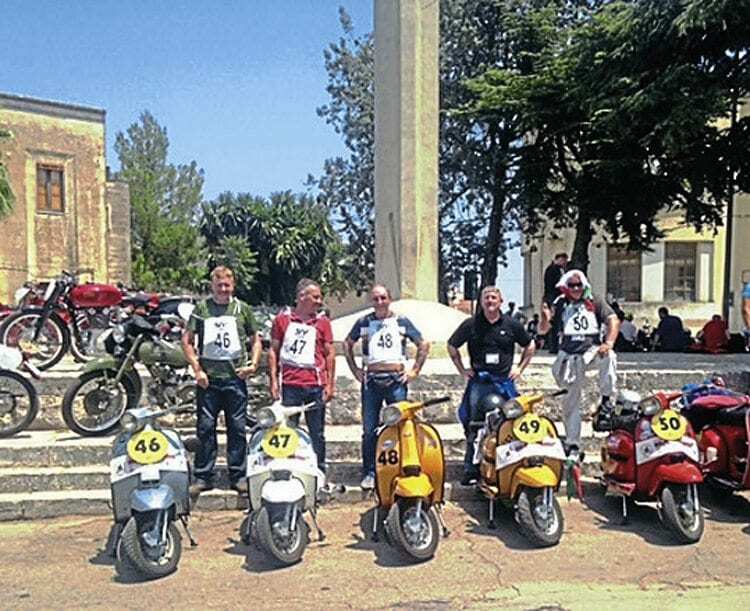 With the majority of entrants being motorcycle riders there has been much talk concerning this group of Lambretta riders entering from Yorkshire. The friendship that has built up though has been great with many referring to them as ‘scooter hooligans’; not because of their rowdy behaviour but due to the way they aggressively ride their scooters, abusing their engines’ power. Many of the motorcycle entrants express their views that they can’t remember Lambrettas going that fast in the years gone by. 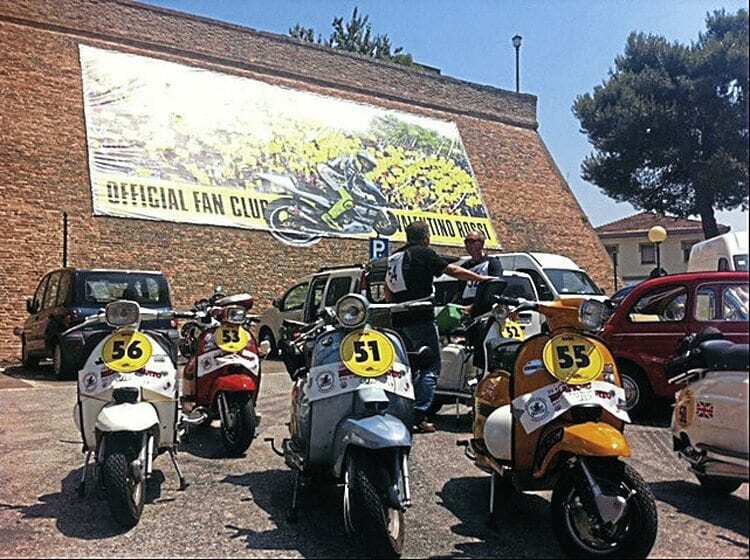 What it does show is the camaraderie and interest owning a Lambretta or any scooter for that matter creates. Quite often it bonds people from different backgrounds together regardless of their views. Dave posing for a quick selfie on the final leg of the race. To Dave entering and just being part of the race are what’s important to him, more than the winning. Every one of the Barnsley Vikings has been presented with a trophy in recognition of their fantastic achievement which they are proud to accept both individually and as a club. With those that have competed welcome back each year the team numbers have grown. Dave himself plans to do the race every year on his GP which is probably best considering the long distance of the race. In saying that, to push himself even further, he has toyed with the idea of doing it on his 75cc Vega. Apparently the race has never been completed by one so this will be another first — we wish him luck with that one. A quick stop off at home for teh Lambretta: the Innocenti factory. Dave is very thoughtful in his approach to the scootering scene in general but is unsure what its future holds in terms of its prospects. Certainly his views on the Lambretta are slightly worrying and possibly that this will be the last generation of big ownership. This he says is mainly down to the cost of buying one in the first place; the high price preventing the younger generation getting involved. Yopu should never lose your direction in Italy thanks to all the road signs. Reminiscing about the old times, Dave’s thoughts are of great times he had, certainly with the LCGB and the events they put on. He feels that the club has changed direction and feels lucky that he was there in what he sees as its glory days. As for the Barnsley Vikings, that’s a different story. In his own words: “I tried to leave and even stopped paying my subs to get kicked out, so they made me an honorary lifetime member.” This was all in jest and he is proud to be part of the long standing club. Signing in for each stage is of the utmost importance if you want to ride. To keep his motivation going when it comes to riding a Lambretta Dave is thinking of even bigger trips and events in the future. In November he is planning on doing the Nomad rally in Africa which will be his toughest challenge to date. 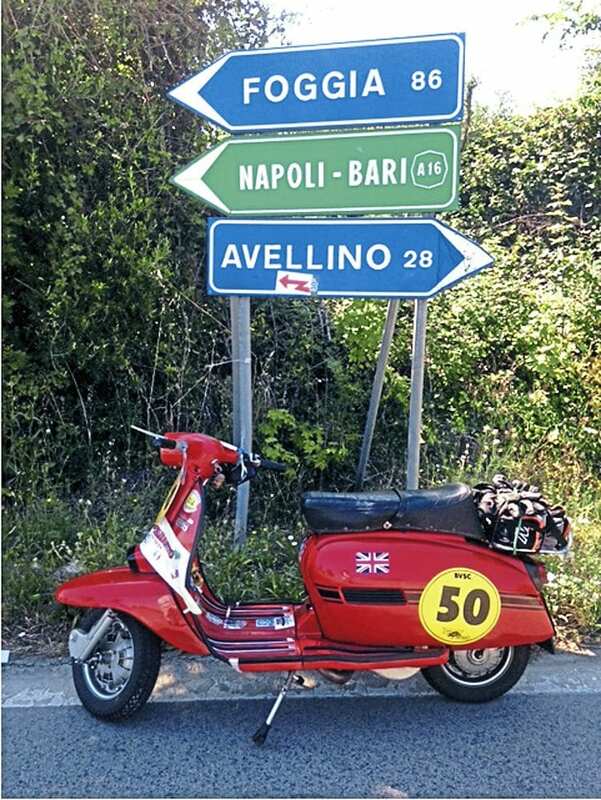 Combining this with the Moto Giro in Italy and the North coast 500 in Scotland, it’s certainly going to be a busy time for both Dave and his Lambretta. His idea is to organise trips to events with like-minded riders to destinations that are new and challenging abroad, as long as they are in the sunshine he added though. Just a few of the cities and countries Dave and his loyal companion have visited over the years. 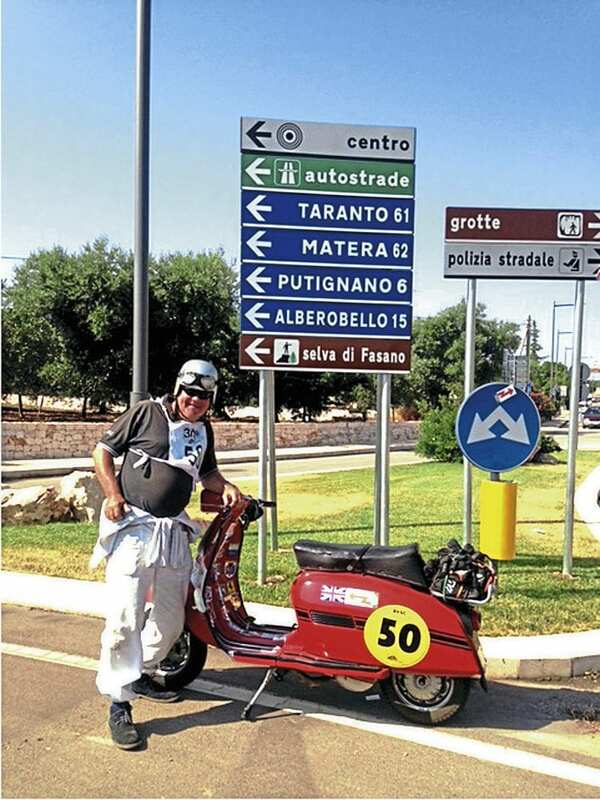 There is no doubt that Dave Waddingham’s Lambretta journey has been a long and fruitful one spanning several decades, something he should be proud of. Where it will take him in the future no one can be sure, not even him. One thing is for certain though it could be anywhere in the world knowing him. Lee Greaves, Karl Darley and Martyn ‘Arthur’ Scully – members of teh Milan-Taranto Lambretta team and legendary Barnsley Vikings scooter club.